Croft begins the spring Alumni Talks with Ben Bates, Croft graduate of 2013. The video conference will take place on Friday, February 1, 2019 at 3:00 pm in the Gerald M. Abdalla Boardroom (Croft 305). 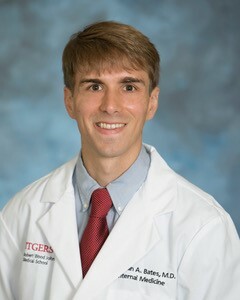 Ben is a second year resident in Internal Medicine Medicine Resident at Rutgers University in New Brunswick, NJ. In addition to medical residency, Ben is also pursuing a Master's in Clinical and Translational Science. The Alumni Talk is open to anyone interested. And all students who are interested in the healthcare field ("anything from direct patient work to global health to the field of healthcare epidemiology") are encouraged to attend! All who are unable to attend but would like to remotely view the session can use this link—https://call.lifesizecloud.com/174353. You may either download the Lifesize app or go directly to the link in a Chrome browser.